Update, 12/16/2014: BeOn's Kickstarter campaign has exceeded its funding goal ahead of Friday's deadline, with 412 backers pledging a total of $105 thousand. BeOn also announced on December 2 that it had raised $1.5 million in seed capital from Dangold Investment Corporation, which would enable the company to accelerate its product-development timeline. What’s better, dispatching the cops after a burglar breaks into your home? Or convincing the criminal that your place just isn’t a desirable target? The BeOn Burglar Deterrent promises to do the latter in a minimally intrusive way. Like a Nest thermostat, BeOn’s smart LED light bulbs will quietly learn your patterns. When you leave the house, use a smartphone app to set the bulbs to “away” mode, and they’ll automatically turn on following similar patterns (although each day will be somewhat unique). If someone rings the doorbell while you’re away, the bulbs will automatically turn on in a sequence that suggests you’re walking from another part of the house toward the door. In either situation, a burglar casing your home will get the impression that the house is occupied and will likely beat a hasty retreat. BeOn launched a Kickstarter campaign today to bring its product to market. The company expects to deliver its bulbs to backers in April 2015 if it can raise $100,000 by December 19. Yeah, we get tired of these crowd-funding campaigns, too. We do our best to cover only the most compelling projects, and this one fits that description. The yellow part of the bulb is a plug-in module. This design allows BeOn to develop new modules with different functions, so you can add features without throwing away the rest of the bulb. Erchak said his team also wanted to avoid over-reliance on the smartphone. 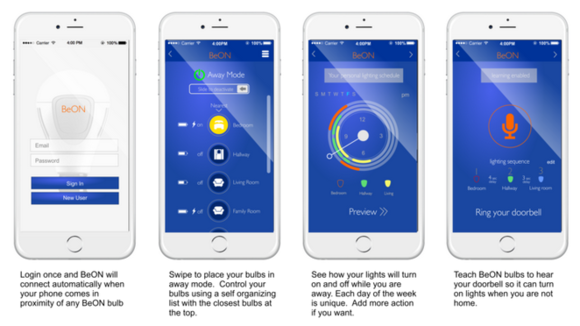 BeOn has an app, but the only thing he thinks you’ll use it for is to put the light bulbs into “away” mode. The app, still in development, might also have an optional reminder that alerts you to arm the lights once you’re out of Bluetooth range, but Erchak didn’t seem to like the idea. “We want to get away from the phone as much as possible,” he said. 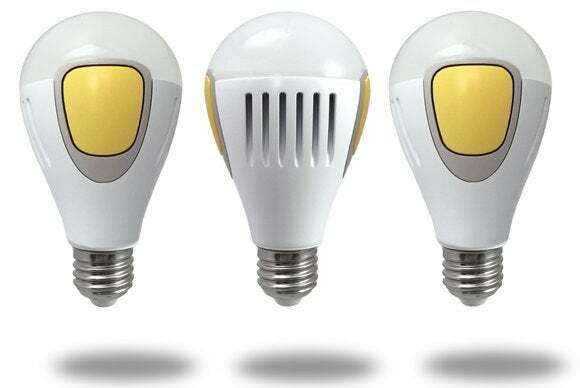 BeOn bulbs operate just like normal incandescent light bulbs, but they’re outfitted with a Bluetooth Low Energy module; a microphone that listens for your doorbell, your smoke detector, and your carbon-monoxide alarm; and a battery backup that can turn the light on even in the absence of AC power. The smoke detector/CO alarm use case could be a lifesaver if you’re home when a fire breaks out or your gas appliances malfunction, turning on lights to guide you out of the house to safety (something the otherwise-excellent Leeo Smart Alert Nightlight can't do). The battery backup is both a safety feature and a crime deterrent. A burglar faced with a neighborhood of darkened homes would never pick the one that’s all lit up. BeOn bulbs are available in two configurations: Standard (they look just like a normal incandescent bulb) and Recessed (these look more like floodlights and are designed to be installed in ceiling cans). Both have standard Edison-style screw mounts and are intended to be installed indoors. They produce 800 lumens of soft white light (color temperature of 2700 Kelvin), equivalent to that of a 60-watt incandescent bulb. There are a few weak links in the BeOn system, but nothing that’s insurmountable. The biggest is that power must be supplied to the socket for the light bulb to do its magic. If you have a lot of lights controlled by wall switches, as my home does, it will be easy to forget to turn those switches on before you put the bulbs into the away mode that turns them off locally until they’re needed. BeOn’s light bulbs use CSR’s Bluetooth flood-mesh-network technology to talk to each other, but Bluetooth low-energy devices have limited range. You’ll need more than the three bulbs in BeOn’s $199 starter pack ($229 for the recessed bulbs) to service a home larger than 1500 square feet. BeOn suggests six bulbs to service a 2500-square-foot home, and nine to handle a 3500-square-foot home. 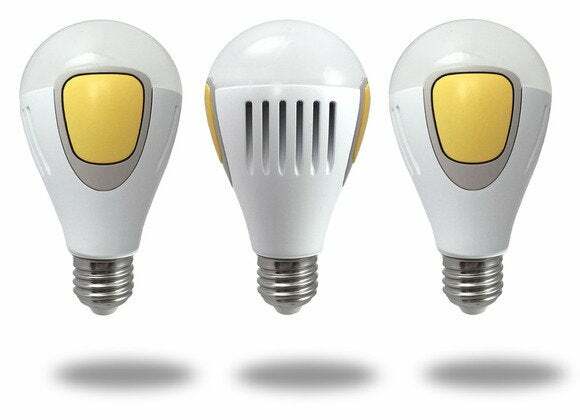 You can control the smart LED light bulbs using BeOn's smartphone app. 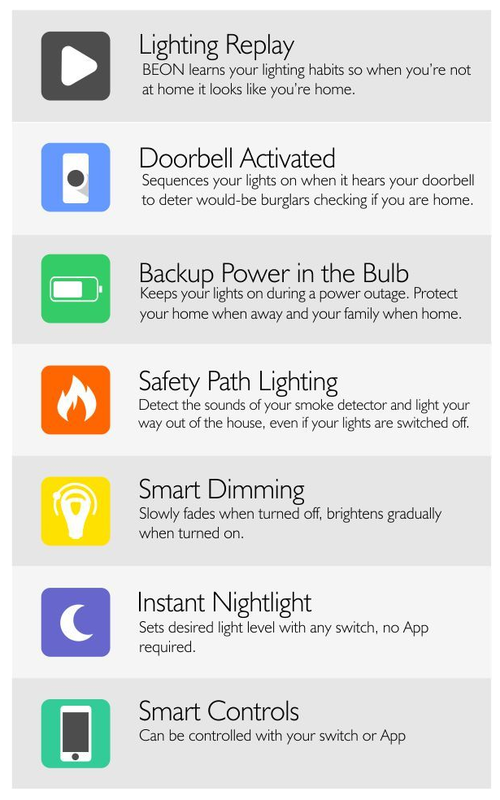 Lastly, the sensors depend on your doorbell. It’s easy enough to install a wireless doorbell if your home doesn’t already have one, but a would-be thief who raps on the door instead of ringing the bell won’t trigger your light show. 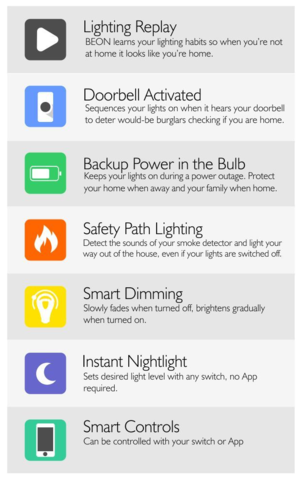 These reservations aside, BeOn has a compelling safety and security solution for the home. The bulbs are more expensive than other smart bulbs, but they deliver features the competition doesn’t. And since they’re rated to last 25 years, that cost gets amortized over a very long period (Erchak says the company is considering offering a lifetime warranty). What do you think? Is this a project you’d consider backing? How do you protect your home now? Share your thoughts with us in the comment section, below.